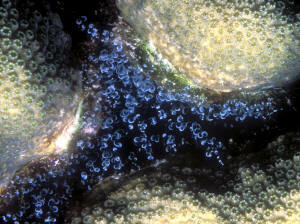 Often, invertebrates are the first to show signs of "bad water" stress. I'm back in the hobby after being in for 5 years and out for 5 years. I had hard water, no water softener and was under the impression all I needed was a good R.O. setup. I never did have all that great of luck in my 5 years. Oh, I could keep things alive for awhile but never really experienced proper coral growth like I have seen other people have. I am now setting up a new aquarium and have drastically downsized due to the money. I had a 125 with a 30 sump and now have a 20 long with the same for a sump. I got this setup from a very experienced person in the hobby, 30 years reefkeeping with outstanding results. Anyway, she said it's really a must to have a water softener in the home first and then the R.O. My big dilemma now is my home is not set up with a softener and would be very difficult/expensive to do here due to the layout of the house. Toting R.O. jugs to and from the store I fear will get old in a hurry. Are there better alternatives for me? Would a particular R.O. unit that you know of eliminate the need for a softener? What do you think? I have just got a LifeSource water filter system for our house installed..
Was wondering if I could bypass the RO system I have for making water for both my freshwater tank and also reef tanks? <I'll let others comment on the situation for reef tanks. But so far as freshwater goes, you do not want to use RO on its own for freshwater fish. I was thinking of getting some blue tetras for a 29 gallon as a single species as they are very aggressive and nippy. These fish are hard to find and expensive per fish if you find them, so I was thinking of breeding them. The thing is the only hope for this is an R/O machine and a membrane to filter the water. This sounds pricey, but maybe cheaper over the long run as a way to breed tetras instead of always buying them. The other option is to buy distilled water if the fish stores have it. <I/we use RO for most potable and cooking uses... have a device that makes 3-5 gallons per day... Not expensive to buy, operate in any period of time. I want to get. Last couple times I purchased Wal-Mart's distilled water it had zero TDS. Now today when I went to get some they were out of the regular distilled that I usually get so instead I purchased the green labeled jugs that are labeled as ''Purified Drinking Water.'' On the label: Source: Natural Spring at Hickory Spring SC. Processed by Reverse Osmosis and/or Steam Distillation, Micron Filtration & Ozonation. I thought ''great'', this should be just as good if not better than the water I usually get but when I got home and tested for TDS it showed 100ppm. I figured since it's labeled as drinking water maybe minerals had been added for taste but it doesn't say anything about added minerals on the jug so now I'm not sure I want to use it in my tank. I was debating on running it through some Poly Filter for a few days to see if the Poly Filter would show (via color change) if anything harmful was in the water. And also thought about testing it for calcium, alkalinity, silicates & magnesium to see if any or all of these are the reason for the high TDS readings. But thought I'd ask here first just in case you know off the top of your head if this water is safe to use as is. So what do you think, is it likely just minerals added for flavor and nothing to worry about? <Likely nothing to worry about. Many salt mixes offered on the market have more than this level/concentration of contaminant components. Far better to put your emphasis on other aspects; enjoying your aquarium experience. Quick question... Yesterday when preparing the dip water I used the pH probe from my main system to match the dip water with baking soda. The pH of the RO/DI was 9.8! (My tap water is neutral at about 7.2). When I started adding baking soda the pH dropped a little at a time until it reached 8.2. Is that supposed to happen? I'm thinking maybe my RO system is in need of cartridge changing. I do spot free window cleaning for my business and bought some resin from a window cleaning supply company in bulk (25lb bag). I thought to myself..hmmm an extra bit of this for the output of my RO unit couldn't hurt. It did, a lot of my corals now look unhappy and my tank has started blooming algae like there is no tomorrow. The tank has been established for 7 years and has NOT had any changes/addition in over a year. It only seemed to take about a month for it to get really bad, and after doing a 20% water change I noticed it got worse. Then I started to assume it was possibly the resin. Now I know if I would have asked first the answer would have been: "I don't think I would take the chance" but since what's done is done, I am trying to see if it is coincidence in timing and there is another possible problem or could the DI be causing my algae blooms? Have you ever heard of a DI resin sold in bulk that maybe leaches phosphates or something else? in the output, but could there have been something else in there that doesn't register in ppm? but don't know how long it should take before I should notice a major difference. I didn't want to do to much more of a water change since I just did 20% a few days ago. I live in earthquake country, also know as Southern California. I am in the process of updating my emergency preparedness kit. I currently store RO/DI water for my reef tank in a large trashcan. I am curious to know if I could use that water for drinking water in case of an emergency. I have read conflicting reports on the safety of using RO/DI water for drinking water. I have read it's never safe, safe temporarily, and always safe. Are you aware of any research based articles on the safety of using RO/DI drinking water on a temporary basis? If it's unsafe, are there any additives that make it safe? I've been running a constant drip system on my 240 gallon aquarium for some time. The water runs through 1 sediment filter, 2 carbon cartridges, and 2 De-ionization cartridges. My filtration unit is located in the laundry room, plumbed off of the washing machine supply spigots. I've recently included warm water from the hot water supply. It just so happened that my timing was perfect as my tank's heater failed soon after, and I had to rely on this warm water to maintain my tank's temperature until the new heater I ordered arrived. I've recently read on one of the forums that I belong to a post regarding a strong concern with "iron" content from one's tap water, particularly water coming from a water heater. I began doing some research and read that De-ionization removes heavy metals including iron. Can you confirm this? I also read that some people measure the TDS to determine when it's time to change out the components in their filters. Is this a good practice? If not, can you suggest a better one? I look forward to your direction. Yes the hot water (now warm after mixing with cold water from the other spigot) does run through the DI system. Can the gas water heater be a source of iron? This is my first email to WWM. I've learned quite a lot while browsing your site the last couple months, and I want to thank you for providing your services. I just stumbled on a comment by Neale that I would like some clarification on if possible. Neale mentions in the first FAQ on the page that: "No! Don't use distilled water for either fish or crayfish! This is VERY, VERY BAD for them. Use dechlorinated tap water, from the drinking water tap, if you have a domestic water softener." Exactly why would Distilled water be ï¿½VERY, VERY BADï¿½ for fish or crayfish? It's pure water (H2O)? It's more pure than what comes out of the RO systems that most experts recommend for aquarium source water. It's certainly better than the water that comes out of the faucets in most municipalities. Personally I'm just curious how it would be bad as I have been using only distilled water in my aquariums for many months now, and have noticed no side effects from it. Usually the reason people try to pass is that Distilled water does not have some of the minerals and such found in tap water, which seems sort of ignorant. I'd personally prefer to add my own minerals to the water so I know exactly what is in it. Not sure if you guys have browsed any municipal tap water reports in the last 10 years or so, but the ï¿½allowableï¿½ levels of some very toxic chemicals is a bit absurd. Things like Arsenic, Uranium, and many other extremely toxic compounds have ï¿½acceptable levelsï¿½ and are actually found in some municipal water sources. There can also be elements like Copper and other heavy metals present in tap water (even dechlorinated or passed through an RO system) which can be very toxic to many invertebrates, even in trace amounts. Then there are the biological contaminants that even chlorine/Chloramine don't get rid of. After seeing Neale's comment I read a little bit on the water quality FAQs on the WWM site and most of the crew seems to be touting the use of RO/DI systems, while bashing distilled water. I'm just honestly curious why. Distilled water is about the purest water you will find outside of a Laboratory. Most labs and hospitals actually have distiller units onsite. You can't beat 0 TDS every time. An RO system might be able to hit 0 TDS when you put a new filter in, but the longer that filter is in use, the worse the water quality gets. Does WWM have a RO/DI sponsor or something? The only real gray area between RO/DI and Distilled is cost. Distilled costs some money for electricity to produce it. RO costs some money on replacing filters and membranes. If you have a back-flush system you are wasting water, and if you don't you are replacing filters more often. In the end I'd think they would cancel each other out on cost. RO is certainly better than Tap water (just about anything is) but it can't hold up compared to the consistent purity of Distilled. And if cost really is the only issue, then why bash it as a product with comments like its ï¿½VERY, VERY BADï¿½? Bob Fenner seems to think its good stuff, except for the cost of it. Some of his comments from various responses concerning Distilled Water: "Hmm, well, on exposure to the air, gasses will/do enter distilled water... but it's not economical to use for aquarium purposes'¦", "For topping off distilled is ideal... not necessary for water changes... but can be used, definitely", "It is okay... just expensive... and impractical insomuch as you've got to go get it and lug it around... R.O. or Deionized (made at home) would be more than fine"
Steven Pro begin_of_the_skype_highlighting end_of_the_skype_highlighting "Distilled water is not good for fish tanks. There is too much of a risk of metal contamination. If you want to use purified water, try RO or DI. Please see here http://www.wetwebmedia.com/rofaq2.htm for more information." Exactly what is ï¿½metal contaminationï¿½? Why would distilled water be more prone to it than any other type of water? "Awfully expensive and heavy to carry home. You might want to take a look at purchasing your own RO unit to make your own purified water source. Besides, RO water is better than distilled." Exactly how is RO water better than distilled? Seriously, it sounds like Steven works for an RO filter company, or is just plain misinformed. Ryan: Would an ordinary household type water distiller produce water of a good enough quality to use for top off and salt mix? "Certainly better than tap water. Be sure to use a dechlorinator, and prepare the water properly. http://wetwebmedia.com/water4maruse.htm"
Why would a dechlorinator be needed on Distilled water? Does Ryan know what distilled means, and the purity of the water a distiller produces? Also, you said "certainly better than tap water". Does this mean it is still not as good as RO water? "Yes, RO water would be ideal"
Another case of stating that RO water is somehow higher quality than Distilled: Neale "No! Don't use distilled water for either fish or crayfish! This is VERY, VERY BAD for them. Use dechlorinated tap water, from the drinking water tap, if you have a domestic water softener." And here its gone from being not as cost effective, not even just an ï¿½inferiorï¿½ product, but Neale actually implies that it is somehow harmful to use it. How is it harmful? I am also involved in Hydroponic gardening, and have had similar conversations around water quality in those circles. That is what got me started using Distilled water in my home in the first place. I have done quite a lot of extensive research into it. From what I have found, most of the ï¿½negativeï¿½ comments about Distilled water originate from RO companies trying to bash the competition. Others are just recycling the same bad information they read somewhere else and are passing it on as a fact. I'm not going to bash RO units. They are certainly much better than straight tap water in most circumstances. I also agree that buying Distilled water from a grocery store is far from economical. RO units are cheaper than distillers on initial cost, but I believe that cost is offset by membrane replacements over time. However, for those that have the desire to try distilled water, those curious about it, or those that are thinking of purchasing a distiller for their home, they shouldn't have to read comments trashing it like the ones I've seen from the supposed experts on this forum. I can definitely agree on the cost issue for those that do not have their own home distiller. Paying 30 cents or more per gallon at a store is far from economical. so the cost is much better than going to a grocery store for RO or Distilled water. The bigger the distiller, the more economical they are to run as well usually. A 1 Gallon per day unit usually costs a bit more to run than a 10 gallon per day unit. I've seen some Distillers capable of producing 600+ gallons per day and they can do it for less than 3 cents per gallon. Granted the initial cost of the Distiller units is very steep, but over the long run they do usually pay for themselves. but I find my tanks are usually around 7.2 before and after water changes and I don't use any buffering chemicals. The existing water in the tank has a small mineral/salt content just from fish detritus decomposing, and that effectively is a buffer of sorts I guess. My water tests in the tanks usually show around 80-100 ppm dH/KH. As long as the tank is cycled with fish in it, and you aren't doing 90% changes weekly, there shouldn't be any real swings. After distilling approximately 500 gallons, I can pull out a quart of scale and sludge. It's just nasty to think that people drink that stuff and the WHO says it's "Ok". On a related note, most US Embassies overseas as well as many of our military bases and federal buildings also run onsite distillers. Those that don't run RO/DI filtration instead. If tap water isn't good enough for the government, I can't really trust them when they say it's good enough for the general population. I can agree that for the casual fish keeper with a single 10 or 20 gallon tank, it's probably ok to use tap water with a water conditioner. Once you start getting over 100 gallons of water though, that water conditioner can start getting expensive if you are keeping up with regular water changes. Also if you have any sort of a top off system running with tap water you can potentially be building up some harmful stuff in the tank water over the long run (i.e. Copper). Anyway, thanks for the comments guys, I appreciate it. I think you misunderstood my comment about testing the water hardness. The water coming out of the distiller is indeed 0 gH/kH. 0 TDS, PH 6. I was saying that when I test the water in the aquariums (those that I do not add Liquid Calcium to), the tests of the aquarium water usually show in the 80-100 range. I was assuming it was PPM but I think you may be right and it is mg/l. Are they the same thing? Info on the net isn't very clear about that. I accidently wrote dH instead of GH in my previous reply. The test kit doesn't measure degrees of hardness, but I think it would be somewhere in the 8-9 degrees range? I'm not really positive where that hardness is coming from. As mentioned I am using only distilled water and no tap water. I do have live plants in many of my tanks, but most of those do not get any added supplements. I assumed the hardness was coming from small bits of uneaten food and fish detritus decomposing. On new tanks over a cycle process it builds up into the 80-100 range and levels off there with water changes. I may skip a water change or two on one of the tanks to see if it climbs much higher than that. For substrate I use black Tahitian Moon sand in all of my tanks, but this is supposed to be chemically inert. I do use some reddish pink shale rock as caves and such in a few tanks as well, but I powdered some of the rock and tested it with muriatic acid and it didn't fizz. Could this still be adding to the water hardness? I think I'll also try getting some jars and putting the Tahitian Moon sand in one and some of the shale in another and see if the hardness climbs in either of them. Would help narrow it down. I've seen some Distillers capable of producing 600+ gallons per day and they can do it for less than 3 cents per gallon. *Is power much more expensive in California? I'm in Reno, NV and we currently pay 11.5 cents per kilowatt/hour. We worked out the 3 cents per gallon calculation off of that. We're not the most expensive in the nation, I'm sure, but there are areas of the country that pay less than 7 cents per kilowatt/hour, so some places could run distillers for even less. *I think it does average up higher after it is in the aquariums. As mentioned my tanks test at 7.2 usually. Sometimes they might climb up to 7.5, but a water change brings them back down to 7.2. I don't see much PH variance other than that. *We'll probably just have to agree to disagree on this one. :) I've read many articles for and against the drinkability of tap water. All published by scientists and doctors. A doctor employed by the WHO or U.S. Government saying that the water is safe to drink is a bit like a cigarette manufacturer 50 years ago telling us that it's safe to smoke. I doubt it's good for business for the government to tell people they shouldn't really be drinking unfiltered tap water. I've heard it stated that the only reason they don't clean the water up more than they already do is just a cost issue. Government saves a few dollars, and people get exposed to some stuff that may be potentially bad for them long term but has usually has no immediate effect. That doesn't sound too far-fetched to me. * I do drive, but that is a necessary risk in my mind. I need to get to work, go shopping, etc. Public transportation is not exactly efficient or convenient, and riding a bicycle 10 miles to and from work each day would arguably put me in even more danger than being inside the metal frame of a vehicle (not to mention the extra time taken out of my days). Drinking and using unfiltered tap water is something that I don't have to do since I have another simple alternative available. I'll agree that many people do drink tap water and are fine with it. I'm not. It only takes 1 mistake with the water suppliers and people can quite literally get killed. As you said, US Embassies and stateside federal buildings use distillation and RO/DI to mitigate the risk of water contamination. If they think it's a valid risk, then it seems like a good prevention step to me too. The Reno. NV area usually gets several 'Boil Alerts' each year because some contaminant makes its way into our water. If we missed even one of those Boil Alerts, my family could potentially become ill. With a home distiller, we don't have to worry about it at all.